With the US upping the ante on the Iranian sanctions and John Kerry unequivocally giving the Iran-Pakistan (IP) pipeline a thumbs-down during his visit to Pakistan, Islamabad is left with two options: a) dump the IP project altogether or b) get the backing of a bigger bully than Uncle Sam. The first option has looked like a shoo-in ever since the PML-N has taken the helm of the government, but the noise generated recently in Beijing suggests that the second option is also being mulled over. The word is that Beijing is keen on including IP in the much touted Kashgar-Gwadar 2,000-km transport link corridor. In a meeting between Chinese and Pakistani officials that is being held today, an MoU is supposed to be signed apropos the economic corridor and IP is also said to be a part of the deal. For China getting the additional gas for its industries would be another plus along with the multi-pronged economic manoeuvres that it can orchestrate via Gwadar; but for Pakistan, the IP gas could be a life saver with the ever escalating gas shortage in the country. 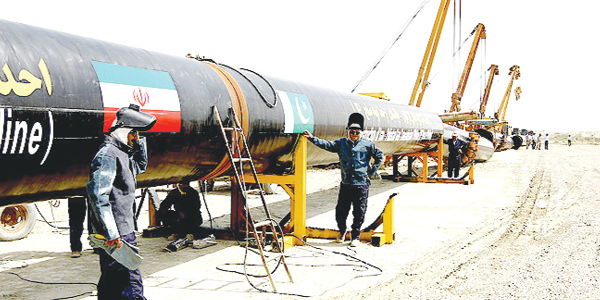 The US has given Pakistan the TAPI (Turkmenistan-Afghanistan-Pakistan-India) pipeline as an alternative – not that Washington needs to give Islamabad any carrots for its stick – for IP, in a bid to steer Islamabad away from any project with Iran. While TAPI has its own positives, not having to deal with the Northeastern part of Afghanistan makes IP slightly more favourable for Pakistan in terms of the security of the project despite traversing the volatile region of Balochistan. However, the US stick has been enough to ward Pakistan off IP, despite the Iranians completing their half of the 2700-km pipeline and giving Pakistan $500 million to instigate work on their own side. Therefore, the only way Pakistan could go for IP is if it could dodge the US stick. And China is possibly the only country that can provide the shield that Pakistan and IP needs. By involving China in the IP project, Pakistan is clearly banking on the bigger fiscal bully in the region, who can keep the US at bay and help complete the project that has been shrouded by the American antagonism in the recent past. Not only would IP give Pakistan 0.75 bcfd gas by 2017 and help bridge the current gas shortfall of around 2.7 bcfd, by linking Gwadar to China through rail, road and a pipeline as well, the Pakistan-China Economic corridor would have the potential to become the trade hub and economic nerve-centre of Asia and eventually the world as well. Not to mention the potential prosperity of Balochistan, a province that has reached aforementioned volatility owing to separatist movements that trace their origins in the criminal negligence of the province’s economic potential by Pakistan governments of days gone by. Linking IP from Gwadar to China seems like being the final roll of the dice for all stakeholders in the project. The only reason why IP has been procrastinated upon – despite the high gas tariff – is the US sanctions on Iran. And the only way those sanctions can be evaded is if China gets attached to the pipeline. Pakistan is about to roll for the last time on the IP front, and if the dice shows the number Islamabad needs, it can get a China-sponsored “Get out of jail free” card that it would need to counter the American monopoly. There no any Separatists in Balochistan particullarly in way of pipe line area in balochistan. The base of insurgency only high level corruption in the province of Balochistan. Official use name of separatists just for dumping corruption. Government must go head and keep strong check on corruption. Insha allah God will help us.